My aim with both these playlists is to show the harp's wide range of color. The harp is often pigeonholed as a romantic, soothing instrument; but it's really capable of so much more! Check out especially the second Caplet Divertissement, Holliger Praludium, and Schafer Crown of Ariadne from the Intro list for some more unusual / percussive harp sounds. 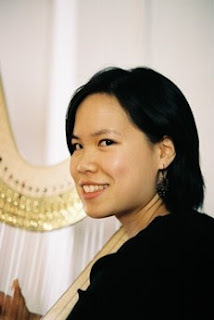 Spotify has an impressive collection of harp music from reputable artists; I've discovered several few works I'd never heard before (including the Genzmer from the chamber music list). I tried to balance between both standard and lesser known works and feature a variety of the excellent artists on Spotify. Both lists also only include works written originally for harp. Harp Music Intro (27 tracks, 2 hours) - A mix of solo works and concerti movements. I arranged it purely according to personal preference, rather than chronologically. I really believe that the harp shines in chamber music. It blends beautifully with a wide spectrum of instruments and voice types; and can easily move between accompaniment and solo roles. The smaller instrumentation also allows it to be heard clearly. For this list, full works are included. You are a national treasure, and the guest post idea is a treasure also! I am always woefully behind in my listening, but do look forward to catching up with all you and your guests have compiled for us. As for the harp, I recommend an addition: John Metcalf's CD, Paths of Song, is entirely harp-based chamber music. Also, though it doesn't appear to be available on Spotify, there is the Harp Scrapbook, for solo harp, which appears on the CD Sea of Glass. Both provide endless pleasure for me, and I hope this will be true for Ruth Mar and for others too. I am very much enjoying listening to Ruth Mar's list. The reason i am highlighting this point is the fact that even after such an overloading Binance Sign Up one that provides the very best trading problems, and that may without a doubt.